The saga of New York's endlessly-delayed Second Avenue subway is so infamous, the TV series "Mad Men" (which took place during the 1960s) used it as a punchline in one episode. New York viewers laughed. And groaned. Even during the timeline of that series, the line was already overdue... a line going under Second Avenue to replace the old east side elevated lines was first proposed in 1919. Today, through much of Manhattan, there is only one subway line that runs up the east side. If you've ever ridden the "Lexington lines" (4, 5, or 6 trains), you know that calling them overcrowded is an understatement the size of the Chrysler Building. The Second Avenue subway went through numerous false-starts.... in 1929, 1932, 1944, 1947, and finally actual construction beginning in the early 1970s. The city's economic crash during that decade put that to an end. In 1981, Gene Russianoff, the city's top transit advocate, referred to the line as "the most famous thing that's never been built in New York City". The city and its infrastructure has changed so much since that initial construction that a section of tunnel dug under Chinatown can no longer be used (they will eventually dig a new, deeper, tunnel through that neighborhood). The project continued its existence in infrastructure purgatory, until a decade ago, when all the elements aligned (political will + actual funding, etc) and construction resumed. It coincided with the start of numerous hugely ambitious NYC projects... Hudson Yards, Brooklyn Bridge Park, the new World Trade Center, and much more. The city is currently building at a rate not seen in over half a century. The decision was made to do the work over 4 distinct phases. 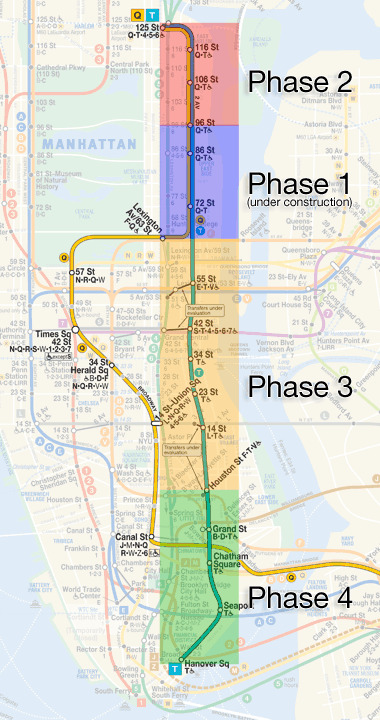 The first 2 phases would simply see a re-routing of the Q line up the Upper East Side, to Harlem. The final two phases would bring it all down to a southern terminus, in the Financial District. A new color (teal) and line designation (T) were decided on for the new (eventual) line. This may or may not happen before you die. Construction began on Phase 1 (the Q re-route) in 2007, with construction currently wrapping up at a furious pace this month. The MTA insists the first phase will open for service before the ball drops in Times Square on New Year's Eve. Total cost so far: $4.4 billion. And yet, that is just one phase down, three to go. Funding for Phase 2 (bringing the Q up to a connection with the 4/5/6 at 125th St) has yet to be approved by the state, and construction is not expected to begin until 2020 (or later?). But still after nearly a century, New York is finally getting a subway under Second Avenue. Even if just a few stops for now. Are New Yorkers happy? Or pessimistic? Probably somewhere in between. Ask most people in the city about the Second Avenue subway, and you'll get the same answer: "I'll believe it when I see it." And maybe soon, seeing will be believing.